But there's much more to Oban than simply a convenient transfer point between train and boat, or somewhere you drive through to catch a ferry. 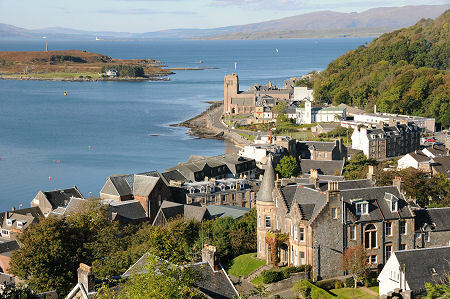 The town itself lies in a crescent that is defined by the hills surrounding Oban Bay. The Bay itself is protected from all but the most severe of weather by the northern tail of the island of Kerrera, which blocks wider seaward views at Esplanade level. For these you need to climb the surrounding hills, from where magnificent westward views extend over the islands of Kerrera and Lismore to Mull and Morvern. Within Oban itself, one of the most prominent features is McCaig's Tower, sometimes (and more descriptively) called McCaig's Folly. This is the Colosseum lookalike that stands above the town and features in many of the postcards you will find for sale in the shops on George Street. The Tower was built by a local banker, unsurprisingly called McCaig, between 1895 and 1902. The aim was to provide work for local stonemasons and provide a lasting monument to his family. The original intention seems to have been to add a large tower placed in the middle, but this, like the statues of McCaig's family that some say were intended to fill the lancet opening in the tower, never materialised. First time visitors to the tower are in for a surprise. The interior comprises a grassy hilltop, with the wall of the tower encircling it like a crown on an uneven head. These days McCaig's Tower serves three main functions. It is a perfect destination for a hard ten minute uphill walk from the centre of the town; it provides a nice walled garden as a respite from the hustle and bustle of the summer shoppers and holidaymakers; and it is a truly wonderful viewpoint, providing the ideal place from which to take the sea/island/sunset photographs that feature on most of the postcards you'll see for sale in Oban that don't actually feature the Tower itself. Oban's second best known viewpoint is Pulpit Hill, to the south of Oban Bay. The magnificent views from here contrast nicely with those from McCaig's Tower, and anyone visiting the town should try to ensure the see it from both perspectives. Well worth a visit while you are in Oban, especially if the weather is unkind, is the Oban Distillery, unusual in being located in the heart of such a busy town. There has been a distillery here since 1794. It can readily be identified by its tall chimney and by its location, almost on the waterfront and immediately underneath McCaig's Tower. It's a shame that they allowed someone to build a brightly painted shop directly in front of the distillery, thereby breaking the visual appeal of the buildings in that part of the town. But that's progress, and it was probably agreed at about the time they decided to knock down the town's Victorian railway station in 1988 and replace it with the much more mundane building you see today. The town has a number of other attractions for visitors. These include two cathedrals. St John's Episcopal Cathedral hides in plain sight, occupying one side of the town's main street, George Street, towards its northern end. The interior is well worth seeing, and because only part of the intended church was built it offers a unique and intriguing blend of a Romanesque cathedral and the Forth Rail Bridge. 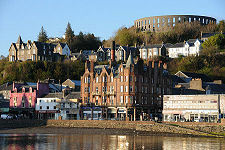 Rather more obvious is St Columba's Cathedral whose tower is a prominent landmark on the north east side of Oban Bay. St Columba's is the seat of the Roman Catholic Bishop of Argyll and the Isles, and was built between the 1930s and the 1950s. It replaced what was known as the "tin cathedral", a temporary pro-cathedral erected from prefabricated corrugated iron in 1886. 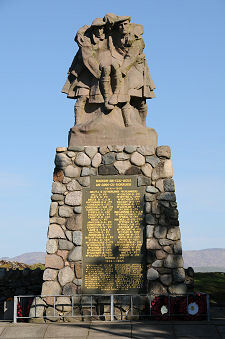 Among the other attractions on offer in Oban is the excellent War & Peace Museum. The museum occupies the ground floor of the Old Oban Times Building and offers visitors a welcoming and well presented introduction to the story of Oban in both peacetime and war. Three quarters of a mile along the shore to the north of the town is Dunollie Castle, for many centuries the most important fortress of the Chiefs of Clan MacDougall. The castle can be visited, as can the nearby "1745 House" into which the family settled when the castle became too impractical for their needs in, as the name implies, 1745. Wherever you turn in Oban, there's no escaping the fact that the town exists because of the sea. It is the main ferry terminus for Mull, Colonsay, Coll, Tiree and Lismore; and there are also sailings from here to Barra and South Uist in the Western Isles. Oddly enough, however, to get to Oban's own island, Kerrera, you need first to travel two miles south along the shore to Gallanach. Oban is also the main base and point of embarkation for the Hebridean Princess, the superb small luxury cruise ship which sails throughout Scottish waters and beyond. 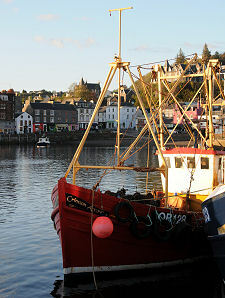 Oban can also lay claim to being the centre for the west coast sailing scene, and it retains a significant fishing fleet. On a nice day there's relaxation and enjoyment to be had by simply strolling the waterfront and admiring the boats. Or the really energetic can start The Coast to Coast Walk to St Andrews from here. 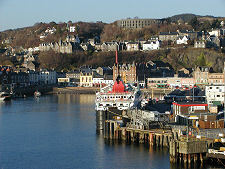 Overall, Oban is a busy place, and can at times be a crowded place: something that is particularly obvious if approaching the town from the north or east by road in summer. But the bustle can add to the atmosphere and certainly adds to the number of eating, drinking and shopping opportunities available in the town. 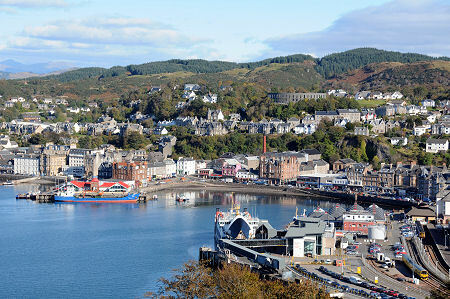 Oban can also be a very attractive place. As a result it has a great deal to offer visitors, whether they are simply passing through or wanting to stop awhile.